The dog days of August are murder on rabbits. July and August are months during which rabbit owners need to follow the weather forecast like a hawk. If the mercury rises above 85-88 degrees F, and your rabbits are not acclimated to the heat, they run a serious risk of overheating to the point of heat stroke and death. Additionally, multiple 85+ F days can result in temporary buck sterility (infertility) lasting 3 months or so, including 1 - 1.5 months after temperatures have dropped into normal ranges. The excessive heat reduces the number of sperm and their ability to travel, killing some of them. What to do? Institute cooling measures for your bucks before they show signs of heat stress, and for sure by the time the ambient temperatures hits 85F. If you live in AZ, TX, OK, MO, or another location with brutal summer temperatures, think about constructing an underground "burrow" for each of your bucks. It’s amazing how cool they will remain even when the temps soar to triple digits. Check out this, and our many other ideas on keeping rabbits cool, here. "I'm very glad to have found a site like this actually. 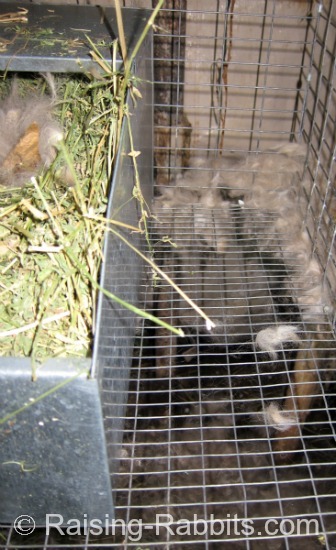 "Not a pet site and not a meat house - a raising rabbits site. A place that understands the purpose of the animal and supplies good information for all ends of the spectrum. "Well done! And to that I don't think there is a person here that raises for meat that doesn't love rabbits and think they are cute. We just like the idea of raising our own food and knowing it was not tortured before we ate it. My 2 cents." Right on all counts - thanks very much Matthew! Rabbit Raisers Problem Solver is the working title for the rabbit resource book that Storey Publications plans to publish in the spring of 2014. It's getting closer! I had no idea writing a book could be such arduous work! It’s been lots of fun, but those deadlines are killer. This is why our e-newsletter has been AWOL for nearly three months. I’m happy to report that the manuscript is finally DONE. "It’s been a lot of work but really worth it. I think we have an excellent book here!" The book content will be presented in a question and answer format. Part 1 is about understanding the rabbit’s nature and the instincts that guide it. It answers questions about bringing home and taking care of pet rabbits, as well as choosing and raising meat rabbits and wool rabbits. 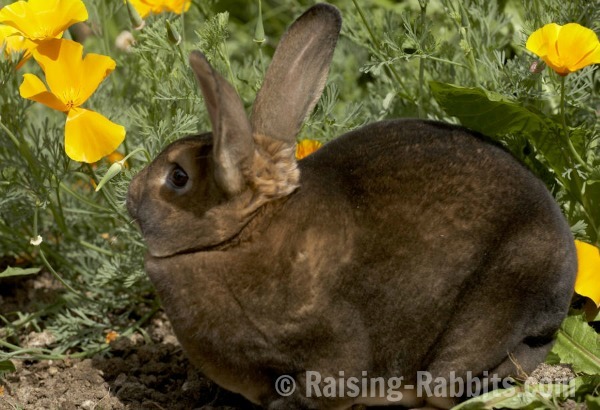 Part 3 is all about reproduction, from breeding to weaning, and sexing your bunnies. Wondering if your rabbit is pregnant? Here you go! Part 4 covers health and diseases. This in-depth, researched material discusses the main health challenges you’re likely to encounter when you raise rabbits, and also some of the less-well-known threats to health. Rabbit Raisers Problem Solver has shaped up to be as extensive a help as I had hoped it could be. That’s partially because of all the awesome interactions with rabbit owners around the USA and internationally that I’ve been honored to engage in. We've had discussions via personal emails, as well as through comments on the Raising-Rabbits.com website. With these two books, Storey's Rabbit Raisers Problem Solver and Storey's Raising Rabbits, you may be set for life with complete guidelines for raising and enjoying healthy and happy rabbits. And now, going forward, we’ll do our best to stick to our usual monthly ezine schedule! 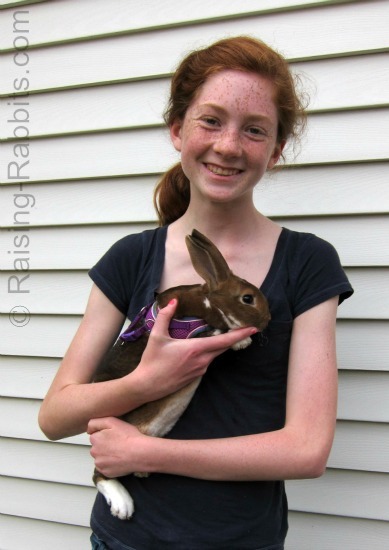 "My rabbit's due date is like tomorrow and she is not making a nest in the nest box. She is just pulling out the hay I put in the box and taking it to a corner of her cage and making a nest there. We talked to the breeder about if she could have them on the wire if that would be ok but she said no, BIG PROBLEM!!!" Glad you’re asking, because your rabbit’s breeder was exactly right. If you allow the doe to kindle in a makeshift nest on the wire, there will be no boundaries to keep the kits inside their nest area. The chance they’ll wander off and freeze is very good. Worse, unless you live in TX and the temperatures are hot all night long, the kits risk chilling to death even inside the makeshift nest due to insulation loss and failures. Pictured: A rabbit’s nest box managed to slide or get pushed away from the side of the cage. And then, when the nest building instinct struck the doe, she figured that the space between the nest and the side of the cage would make a perfect "burrow." You can see that she pulled lots of fur to line her nest, and then if you look through the wire at the ground, you’ll find that enough fur for 5 more nests had slipped through the wire to the ground. For several days I kept shifting her nest attempts into the box (not counting the fur on the ground), and then pushed the box back into the corner. The doe finally kindled her kits...on the wire in a new pile of fur! Thankfully, they were still alive, and I was able to lift the whole thing - nest and kits - and place them into the nest box, once again shoving the nest box into the corner on top of her chosen nesting spot. I have no idea why it took days for the concept to click with the doe, but fortunately, her instincts were sufficient, and she ended up taking great care of her kits where they belonged - inside the nest box. What you can do is the same thing I did - put her nest inside the nest box as many times as it takes. You’ll want to check this doe frequently, because if she, like my doe, ends up kindling on the wire, you’ll want to immediately put the kits into the nest box where they belong. We’ve written more about ensuring the doe gets the kindling process right, here. Your friends at Raising-Rabbits.com wish you a wonderful August 2013. Stay cool, and enjoy your rabbits!